It also has a thick pad to cover up the springs to make sure that no fingers or toes get into the spring area. This cover will help make sure no one gets pinch, and the enclosure will make sure that no one falls off. This trampoline was designed with the safety minded people in mind. The frame of the JumpSport Elite Trampoline is a beautiful powder coated steel that is a rich dark blue. The powder coating helps protect the steel from rusting, and also makes the trampoline look great in your yard. You won’t have to worry about the neighbors complaining that your trampoline is an eye sore. The frame uses a W shaped leg system which helps increases the stability and also the durability of the trampoline. This trampoline will last for years. Check latest prices here. The springs of this trampoline are also made of high quality steel. The spring technology is where some of the added safety futures come in that are not visible to the eye. The springs use a patented StagedBounce technology. What this means is when the jumper lands half the springs engage. Then a few seconds later the other half of the springs engage. What this does is it slows the jumper down more slowly. You know that if you jump on a hard surface, your joints take all the impact, well jumping on a normal trampoline the springs take some impact, but your body still takes a lot of it. With this StagedBounce technology the springs take much more of the shock. This reduces injuries to your body. Jumping can be great exercise, but it can come with shock to joints. The StagedBounce technology reduces this and keeps jumping fun and safe. One danger with trampolines is the exposed springs on some models. Well with the JumpSport Elite Trampoline you do not have to worry about this. 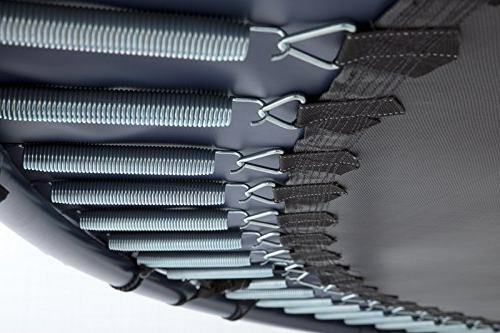 It includes a high quality padding that covers these springs. The padding is thick, made up of 21-ounce PVC outer covering, and a full width one inch thick gym-quality EPE foam core. This makes it so if you have a soft area to sit on the edge and put your shoes back on or take them off. On top of this protective covering the trampoline has an interior enclosure that keeps the springs on the outside of the jumping area. 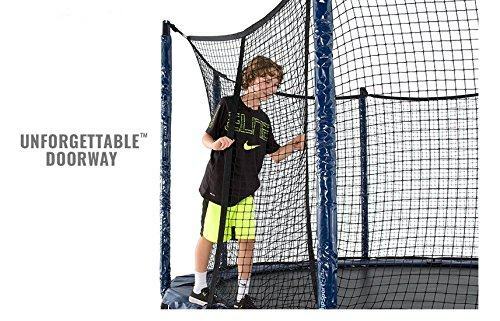 The trampoline nets are made of a high quality net similar to the high quality jumping mat. The padded poles hook to the legs and go up to form a ring which the net hangs down from. 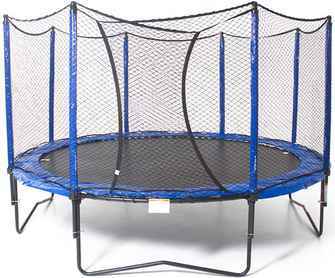 So if you are safety conscious then the JumpSport Elite 12 foot Trampoline is perfect for you. They designed it with you in mind. It is still made up of all the same high quality materials though, so you aren’t giving up on a great long lasting bouncing experience by adding in the extra safety that the JumpSport Elite Trampoline provides. Read more here >> You can also check our best trampoline for adults guide for other options.